QTY 1234567891011121314151617181920212223242526272829303132333435363738394041424344454647484950515253545556575859606162636465666768697071727374757677787980818283 Please select a quantity. Black plastic body holds 2 reversible chrome screwdriver tips & has covering end caps, 1 w/a pocket clip. Body w/caps on is 5 1/4" long. 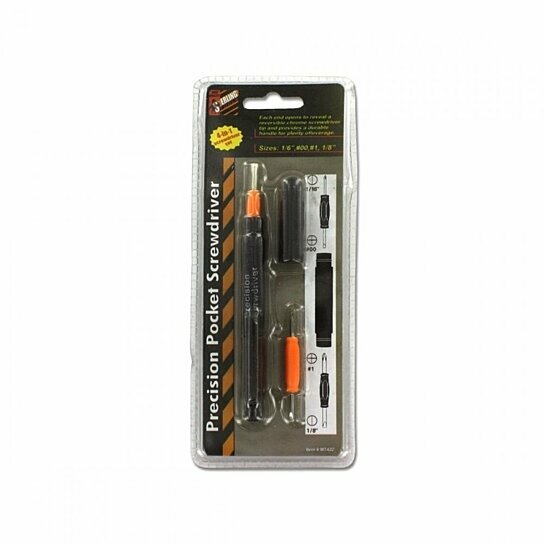 The red handled screwdriver tips are Phillips size 00 & 1 & Slotted size 1/16" & 1/8". Comes in blister card package with UPC code.